Make your next Hen or Stag party memorable with Leicester Executive Chauffeurs doing the driving. Our professional drivers will ensure you get to your destination safely and are returned home safely making your evening out that much more enjoyable. Why concern yourself with the hassles and risks of driving when you can relax in the comfort and safety of one of our luxurious high-end automobiles? With a chauffeur-driven car, you can end your single life in pomp and style. You may only have this one opportunity to celebrate the end of your freedom, so you should party like there’s no tomorrow. And the only way you can do this is when there’s a designated driver. Leicester Executive Chauffeurs is on hand to ensure that you celebrate a great night and experience the best party ever. 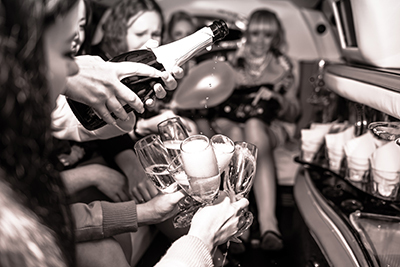 With our stag and hen parties chauffeur services, the fun can start right from the moment you step out of your door and into your hired vehicle. We offer a range of automobiles, so we can cater to a small or large group. From a luxury car to a coach hire customised to accommodate a party on the go, we can provide the transportation suitable for your needs. 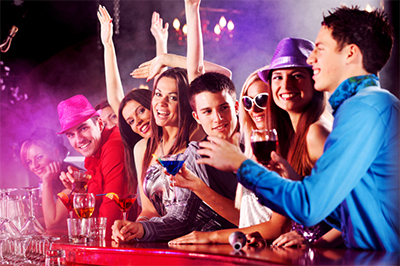 Tell us how many people will be partying with you and we will recommend the vehicle most suitable for the occasion. We guarantee a smooth ride within the confines of a spacious, comfortable and luxurious interior. Leicester Executive Chauffeurs will ensure you receive the type of treatment you expect from the UK’s top chauffeur service; your needs are our main focus. With a dedicated team of drivers, Leicester Executive Chauffeurs will chauffeur your group to the venue or venues of your choosing and make sure everyone is accounted for and is returned to their original pickup point or hotel at the end of the evening. Our reliable, punctual, courteous and friendly chauffeur will ferry you to and from your destination, or wherever you want to go, depending on your transportation arrangements. No questions asked. Hiring a chauffeur-driven car is more cost-effective than hiring several taxis to transport an entire group. You save more money with a single hire car, than several separate vehicles. More money for you to spend at the open bar. With a chauffeur behind the wheel, you don’t need to concern yourself about parking, which is often scarce in most party venues and when almost everyone is out partying. And during hen & stag parties, you can bet everyone will be out having fun. Since you don’t need to worry about driving either, you can party all you want and still return home safe and sound. Partying for the first time in a new town or city? You don’t need a GPS or to study the map to get from one venue to the next with a chauffeur on hand. Leave the navigating to them so you can relax and enjoy the ride. A chauffeur-driven car is easier and less stressful than a self-drive transfer. No drinking and partying for the designated driver either, which is no fun. No one in your group should be left behind. Whether your group is out on the town or mixing it up at the hotel, having safe, reliable transportation is always a must and Leicester Executive Chauffeurs has the experience and local knowledge to make your evening a hit. 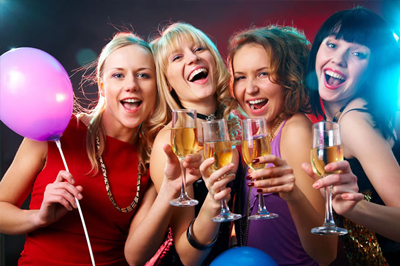 Choose us for your next Hen or Stag party and experience the LEC difference. Our quality and dedication is what keeps our customers coming back for more. For every great wedding, there should be a great hen & stag party. Leicester Executive Chauffeurs can help ensure you get the best celebration ever.